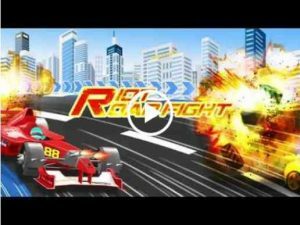 Riot Road Fight is competition game, beyond any limit. You will never get enough of it by accelerating vehicle , passing your racing rivals and shooting anything that get in your way. This is not just a racing game, but also a shooting game. It gives you experience that only exists in blockbusters. While racing on the road, you can collect as many coins as you can and avoid any obstacles on your way. And one of the most important point, this is free. You can enjoy it without making any purchase. You can play this game in your own way, customize your car and weapons with your style. And then show your power to challenge other players. The game combines an endless roadway and shooting action. On the way, there are many things for you to discover. You will need to dodge away from random rockets, missiles, and roadblocks while jumping over to grab power ups like, boosts, wrenchs, score multipliers, and magnets to gain additional advantages over enemies and bosses. Collect coin to upgrade weapons and armor. If you are a fan of racing games and shooting games, you are sure to enjoy this style of combat racing arcade game. Get ready for a Riot Road Fight ! Just download it and start drifting. Nice and simple, I love it…. This game is good in its design and game play but it’s next to impossible to get any sort of meaningful amount of coins as you get 1 per car and you miss most of them cause of traffic, this game has been made to force you to buy coin packs through sheer frustration cause of the way the game is set up. Big thumbs down for that. good game . it can entertain you a lot . I love it; still getting the hang of it but I’m a Road Riot fan. I been raceing Road Riot for over a year now and it’s nice to Play a different Race. I feel it’s challenging and Fun.